Roger Hoover is Jacksonville's third Southern League Broadcaster of the Year, joining Terry Smith (now with the Los Angeles Angels) in 1979 and J.P. Shadrick (now with the Jacksonville Jaguars) in 2008. 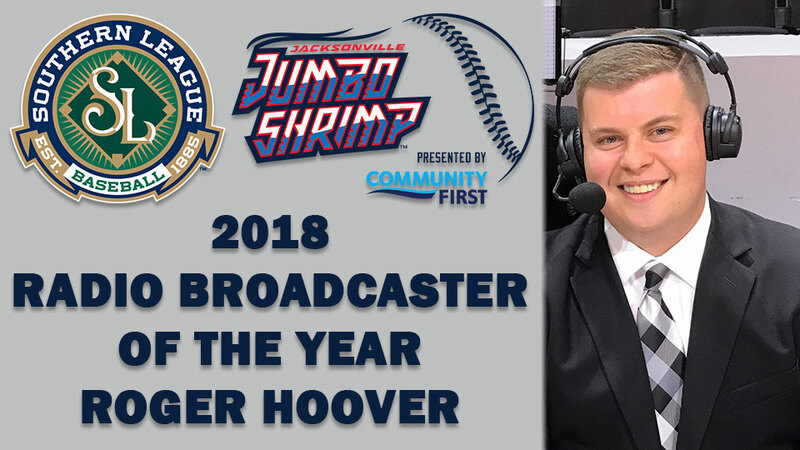 JACKSONVILLE, Fla. - The Southern League announced on Monday that Jacksonville Jumbo Shrimp Director of Broadcasting and radio play-by-play announcer Roger Hoover is the 2018 Southern League Radio Broadcaster of the Year, as selected by a vote of the league member clubs' general managers and radio broadcasters. Hoover recently completed his 11th season broadcasting minor league baseball, 10th in the Southern League and seventh for Jacksonville. In addition to calling the 140-game Southern League season on the Jumbo Shrimp Network presented by Community First Credit Union, Hoover has also called an extended weekend of Miami Marlins spring training games each of the past three seasons. "I am truly humbled by this honor from the Southern League," Hoover said. "This award is a reflection of the hard work of our great staff on the Jumbo Shrimp Network and would not have been possible without the exemplary efforts of my broadcast partner Marco LaNave and producers Jeanie Verderese, Jacob Lovelace, Joe Mixie, Roland Stamm, Eilish Thomas, and Brian and Cody DeLettre." On July 4 in Mobile, a foul ball destroyed Hoover's laptop computer screen, but he called the moment with composure and professionalism that was lauded in local and national media attention including ABC's Good Morning America, CBS This Morning, FOX & Friends, Deadspin, MLB.com, Sports Illustrated, USA Today and Yahoo Sports. He posted audio online for fans to enjoy the humor of the occasion and persevered through the misfortune, completing game notes on his hotel TV screen and calling the next week of games without the laptop. "I am appreciative of our great leadership team in Jacksonville led by Ken Babby, Harold Craw, Noel Blaha, and Linda McNabb for giving us the tools to build a successful broadcast," Hoover said. "I am also grateful to my fellow broadcasters in the Southern League for their years of guidance and camaraderie." Hoover is Jacksonville's third winner of the annual award, joining Terry Smith (now the lead radio voice of the Los Angeles Angels) in 1979 and J.P. Shadrick (now a host with the Jacksonville Jaguars Radio Network and Jaguars.com) in 2008. As the Jumbo Shrimp's Director of Broadcasting, in addition to play-by-play, Hoover authors and produces the broadcast theme, internal broadcast spots, and full broadcast log, and manages the radio broadcast team. He has instituted several unique elements. Each home broadcast features a live in-game interview highlighting a person or event at the game, a live postgame interview with a player from the winning team, and postgame comments from the Jacksonville manager. Postgame interviews and highlights are included in the online game recap, social media, SoundCloud and YouTube channel, which also features Hoover hosting the pregame "Shrimp Show" that airs on the video board at home games at the Baseball Grounds of Jacksonville. Hoover has bolstered fan engagement with a daily "Shrimp Live," using the team's Facebook Live stream to give fans the atmosphere of ballparks across the league. "Roger Hoover gives fans an excellent window into Jacksonville baseball, and we are happy the Southern League has recognized his great work with this award," said Jumbo Shrimp General Manager Harold Craw. "We are excited to have Roger as a valued member of our front office and outstanding representative of the Jumbo Shrimp." A native of Kingsport, Tennessee, and 2010 graduate of the University of Tennessee, Hoover had previous minor league stops with the Tennessee Smokies and the Kingsport Mets. In the baseball offseason, Hoover is in his fifth year as the radio play-by-play announcer for University of Alabama women's basketball on the Crimson Tide Sports Network. He also provides play-by-play for SEC Network+ broadcasts of college baseball, basketball, softball, and soccer, with all broadcasts available on the ESPN app. UP NEXT: The Jumbo Shrimp host their next Family Movie Night in cooperation with Fun 4 First Coast Kids on Saturday, Sept. 22, at the Baseball Grounds of Jacksonville. The screening of "Trolls" will be on the video board at 7 p.m. Gates open at 6 p.m., and the concession stands, Kids Zone inflatables and Jumbo Shrimp souvenir store will be open. Admission is just $1 per person at the gate, but the Jumbo Shrimp encourage attendees to RSVP at umbel.co/m877F. The 2019 season presented by Community First Credit Union opens on Thursday, April 4, at the Baseball Grounds Jacksonville. ABOUT THE JUMBO SHRIMP: The Jacksonville Jumbo Shrimp offer affordable family fun at the Baseball Grounds of Jacksonville. Their inaugural season garnered the Southern League's Don Mincher Organization of the Year, Promotional Trophy, and Jimmy Bragan Executive of the Year, won by General Manager Harold Craw. In 2018, the team was a finalist for "Sports Breakthrough of the Year" in the Sports Business Awards. To experience the excitement with the terrific value of ticket and group options, call the Jumbo Shrimp at (904) 358-2846 or visit www.jaxshrimp.com.